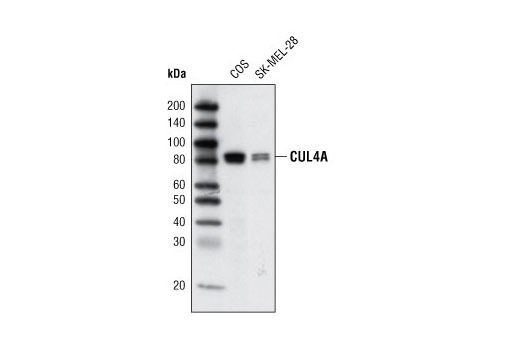 Western blot analysis of extracts from COS and SK-MEL-28 cell lines using CUL4A Antibody. 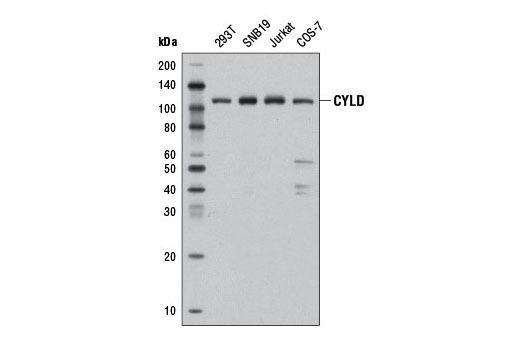 Western blot analysis of extracts from various cell lines using CYLD (D6O5O) Rabbit mAb. 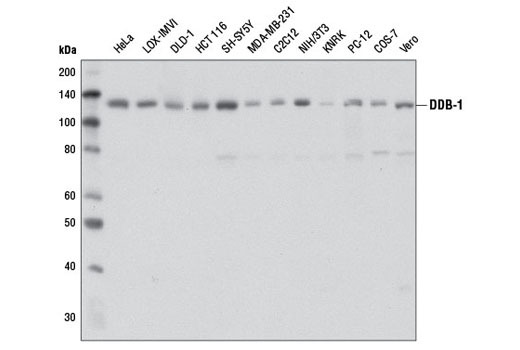 Western blot analysis of extracts from various cell lines using DDB-1 (D4C8) Rabbit mAb. 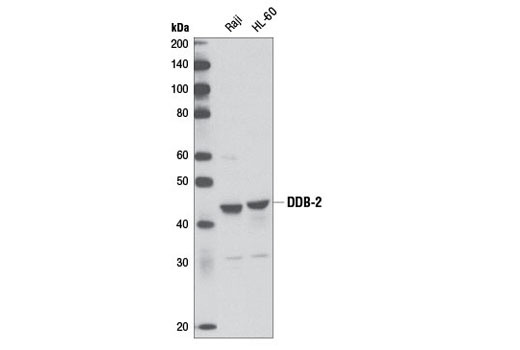 Western blot analysis of extracts from Raji and HL-60 cells using DDB-2 (D4C4) Rabbit mAb. 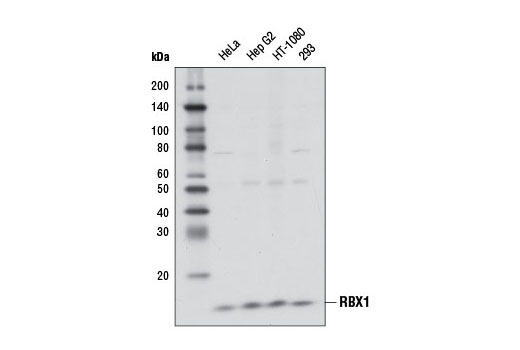 Western blot analysis of extracts from various cell lines using RBX1 (D3J5I) Rabbit mAb. 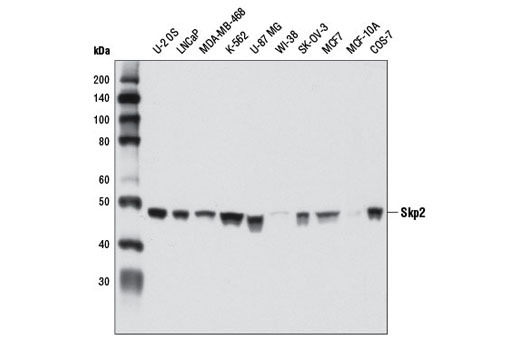 Western blot analysis of extracts from various cell lines using Skp1 (D3J4N) Rabbit mAb. 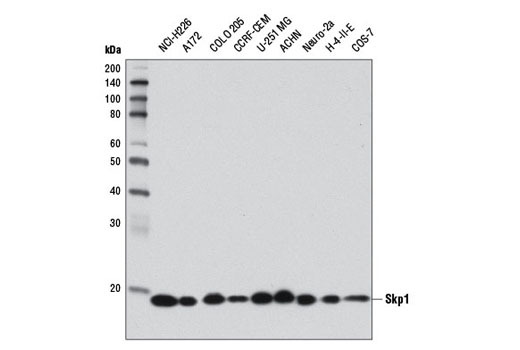 Western blot analysis of extracts from various cell lines using Skp2 (D3G5) XP® Rabbit mAb. 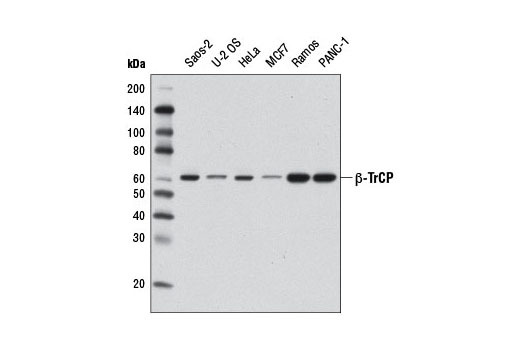 Western blot analysis of extracts from various cell lines using β-TrCP (D12C8) Rabbit mAb. 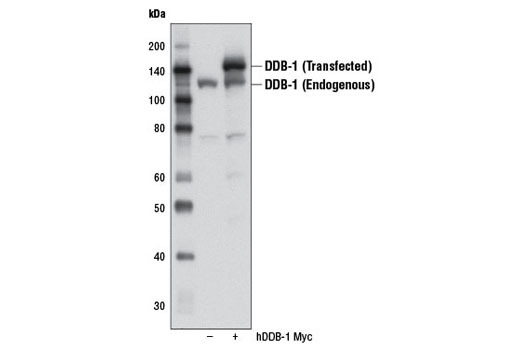 Western blot analysis of extracts from 293T cells, either mock transfected (-) or transfected with a Myc-tagged cDNA expression construct encoding full-length human DDB-1 (+), using DDB-1 (D4C8) Rabbit mAb. 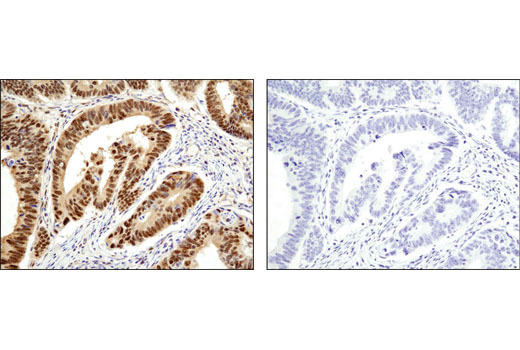 Immunohistochemical analysis of paraffin-embedded human colon carcinoma using RBX1 (D3J5I) Rabbit mAb in the presence of control peptide (left) or antigen-specific peptide (right). 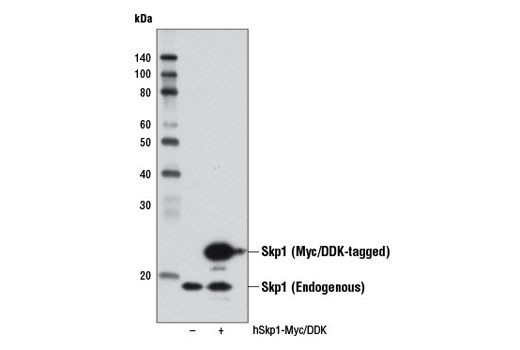 Western blot analysis of extracts from 293T cells, mock transfected (-) or transfected with a construct expressing Myc/DDK-tagged full-length human Skp1 isoform b (hSkp1-Myc/DDK; +), using Skp1 (D3J4N) Rabbit mAb. 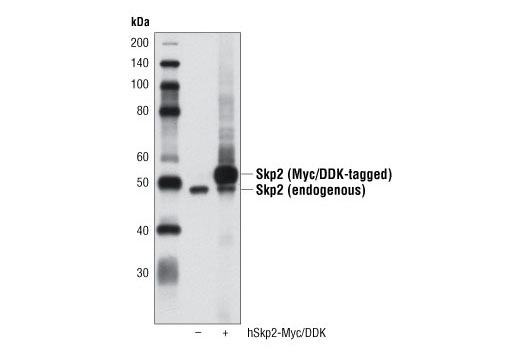 Western blot analysis of extracts from 293T cells, either mock transfected (-) or transfected with a Myc/DDK-tagged cDNA expression construct encoding full-length human Skp2 (hSkp2-Myc/DDK, +), using Skp2 (D3G5) XP® Rabbit mAb. 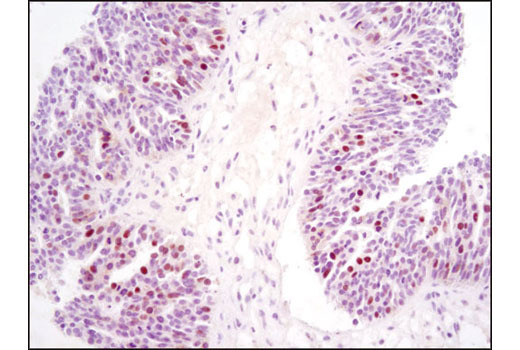 Immunohistochemical analysis of paraffin-embedded mouse prostate using RBX1 (D3J5I) Rabbit mAb. Immunoprecipitation of Skp1 from 293T cell extracts using Rabbit (DA1E) mAb IgG XP® Isotype Control #3900 (lane 2) or Skp1 (D3J4N) Rabbit mAb (lane 3). Lane 1 is 10% input. 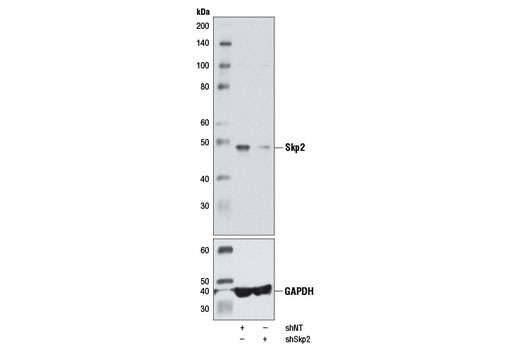 Western blot analysis was performed using Skp1 (D3J4N) Rabbit mAb. Western blot analysis of extracts from HeLa cells expressing either non-targeting shRNA (shNT) or shSkp2, using Skp2 (D3G5) XP® Rabbit mAb (upper) and GAPDH (D16H11) XP® Rabbit mAb #5174 (lower). 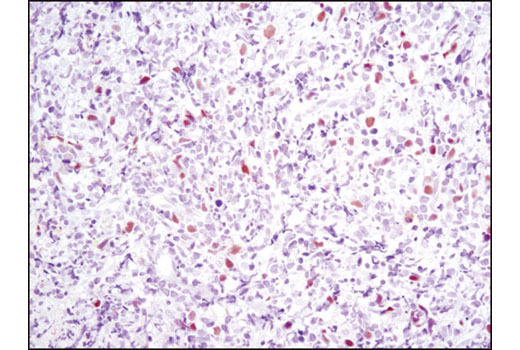 Immunohistochemical analysis of paraffin-embedded human lung carcinoma using Skp2 (D3G5) XP® Rabbit mAb. 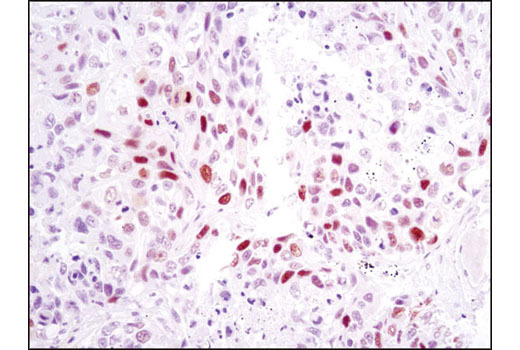 Immunohistochemical analysis of paraffin-embedded human lymphoma using Skp2 (D3G5) XP® Rabbit mAb. 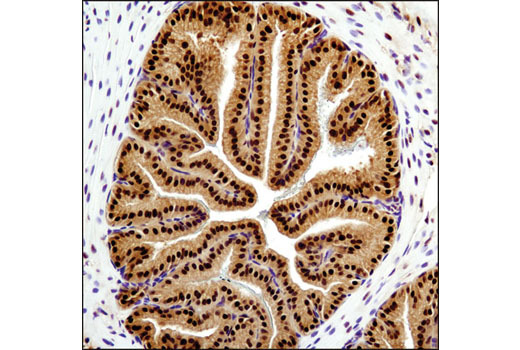 Immunohistochemical analysis of paraffin-embedded human ovarian carcinoma using Skp2 (D3G5) XP® Rabbit mAb. 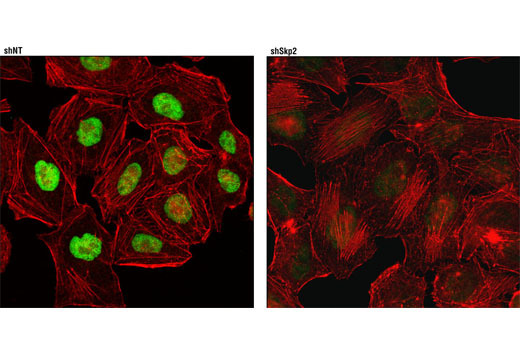 The Ubiquitin E3 Ligase Complex Antibody Sampler Kit provides an economical means to study multiple protein components of ubiquitin E3 ligase complexes. The kit includes enough antibody to perform two western blot experiments per primary antibody. Each antibody in the Ubiquitin E3 Ligase Complex Antibody Sampler Kit recognizes endogenous levels of its respective target protein and does not cross-react with other family members. 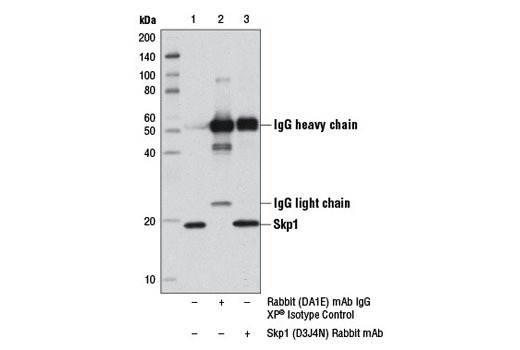 The Skp2 (D3G5) XP® Rabbit mAb is predicted to cross-react with Skp2a and Skp2B proteins. Monoclonal antibodies are produced by immunizing animals with a recombinant protein specific to human CYLD protein, a synthetic peptide corresponding to residues surrounding Gly832 of human DDB-1 protein, to residues surrounding Ala174 of human DDB-2 protein, to the carboxy terminus of human RBX1 protein, to the carboxy terminus of human Skp1 protein, to the amino terminus of human Skp2 protein, and with a recombinant protein specific to human β-TrCP protein. Polyclonal antibodies are produced by immunizing animals with a synthetic peptide corresponding to residues surrounding Ser12 of human CUL4A protein. Polyclonal antibodies are purified by protein A and peptide affinity chromatography. Ubiquitin can be covalently linked to many cellular proteins by the ubiquitination process, which targets proteins for degradation by the 26S proteasome. Ubiquitin is first activated by forming a thiolester complex with the activation component E1. The activated ubiquitin is subsequently transferred to the ubiquitin-carrier protein E2, and then from E2 to ubiquitin ligase E3 for final delivery to the ε-NH2 of the target protein lysine residue (1-3). Research studies suggest that activated E2 associates transiently with E3, and the dissociation is a critical step for ubiquitination (4). S phase kinase-associated protein 1 (Skp1) is a critical scaffold protein of the Skp1/CUL1/F-box (SCF) E3 ubiquitin ligase protein complex. Various F-box proteins (e.g. β-TrCP, Skp2) mediate an interaction with Skp1 via their defining and conserved domain of 40 amino acids and with substrates to be ubiquitinated (5). RING-box protein 1 (RBX1 or ROC1) is another essential component of the SCF complex (6). RBX1 mediates the neddylation of CUL1, which activates SCF E3 ligase by facilitating the ubiquitin transfer from E2 to substrates (7-9). The RING finger domain of RBX1 is required for ubiquitin ligation (10). Cullin-4 (CUL4) is a member of the cullin family of related ubiquitin ligases (11). The carboxy-terminal domain of CUL4 interacts with Rbx1 and E2 enzyme while the amino-terminal CUL4 domain interacts with BPB domain of UV-damaged DNA binding protein DDB-1 to form a CUL4-DDB1 ubiquitin ligase complex (12). 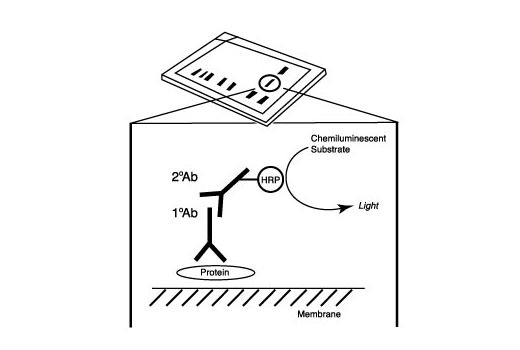 Damaged DNA-Binding Protein (DDB) consists of a 127 kDa subunit (DDB-1) and a 48 kDa subunit (DDB-2) that contribute to the formation of the UV-damaged DNA-binding protein complex (UV-DDB) (13-15). In conjunction with CUL4A and RBX1, the UV-DDB complex forms an E3 ubiquitin ligase that recognizes a broad spectrum of DNA lesions. The complex polyubiquitinates components of the nucleotide excision repair pathway (16-18). Ciechanover, A. (1998) EMBO J 17, 7151-60. Zheng, N. et al. (2002) Nature 416, 703-9. Reardon, J.T. et al. (1993) J Biol Chem 268, 21301-8. Hochstrasser, M. (2000) Nat Cell Biol 2, E153-7. Kamura, T. et al. (1999) Genes Dev. 13, 2928-2933. Keeney, S. et al. (1993) J Biol Chem 268, 21293-300. Hochstrasser, M. (2000) Science 289, 563-4. Morimoto, M. et al. (2003) Biochem Biophys Res Commun 301, 392-8. Hwang, B.J. and Chu, G. (1993) Biochemistry 32, 1657-66. DeSalle, L.M. and Pagano, M. (2001) FEBS Lett. 490, 179-189. Pan, Z. Q. et al. (2004) Oncogene. 23, 1985-1997. Chu, G. and Chang, E. (1990) Proc Natl Acad Sci U S A 87, 3324-7. Deffenbaugh, A. E. et al. (2003) Cell 114, 611-622. Sun, Y. et al. (2001) Antioxid Redox Signal 3, 635-50. Hirschfeld, S. et al. (1990) Mol Cell Biol 10, 2041-8. Payne, A. and Chu, G. (1994) Mutat Res 310, 89-102. Petroski, M.D. and Deshaies, R.J. (2005) Nat Rev Mol Cell Biol 6, 9-20. Lee, J. and Zhou, P. (2007) Mol Cell 26, 775-80.